Prehistoric America was written by Anne Terry White. Prehistoric America was published by Random House Books For Young Readers. About Anne Terry White (Author) : Anne Terry White is a published author of children's books. 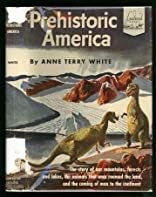 Some of the published credits of Anne Terry White include Odysseus Comes Home from the Sea, Robinson Crusoe, Prehistoric America.